In the previous article here, I explained how to create a Custom Post Type. In this article I will show you how to create custom taxonomies in WordPress. Taxonomies are a grouping mechanism for the post types in WordPress. For example, you group together categories of posts by creating categories, similarly you can group together custom post types or any existing post type by creating a taxonomy. The names created to group together the posts are called “terms”. Why do I need a custom taxonomies in WordPress? 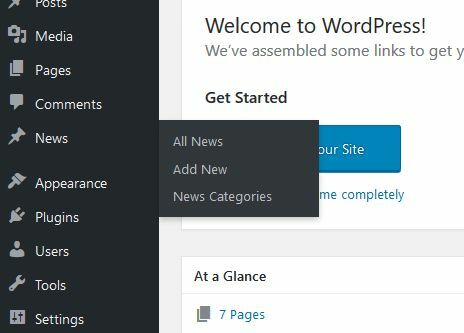 How to create a custom taxonomies in WordPress? In the line above, the news_cat is the name which will be stored in the database for this taxonomy. It has to be lowercase without any spaces. Underscores are allowed. It cannot exceed 32 characters as well. The “slug” defines the URL of your custom taxonomy pages. Suppose you create a term called “sports”, the URL of that page would be example.com/news-category/sports/. Again this should not contain spaces and has to be “unique” so that name “conflicts” don’t occur.